There is this awesome challenge called #wirlackieren for which Marzipany and Tinesuchtnachmehr announce one (or sometimes two) brands per month that everyone in the nail community will obsessively paint their nails with 😀 Everyone tries to show as many polishes of that given brand as possible within that month. The brands in February are Cirque Colors and Cadillaquer. Unfortunately, I don’t own any polishes from Cadillaquer. But at least I have two (!) polishes from Cirque Colors that I can show you! Yay! I bought these back in the day (2014), when a good glitter polish was hard to come by and when neon and matte glitters were the new thing in the nail world. I was obsessed with Electric Circus so I had to have it! I must admit the only reason why I ordered the second one (Kaleidoscope) was so that Electric Circus wouldn’t be so lonely. But I never regretted getting Kaleidoscope as well! Both Electric Circus and Kaleidoscope are one of the highest quality glitter polishes I own, and the glitters haven’t bled out or faded after 4 years, which is quite impressive! So here is one coat (!) of Electric Circus over a white base (Catrice – Milky Bay). The glitter payoff is insane! It is really fool-proof and one coat gives an even coverage as shown on the picture below. I added one coat of Seche Vite Quick Dry Top Coat. Next up is Kaleidoscope. It is a beautiful combination of various sizes and shapes of matte glitters. I didn’t put this one over a white base because it contains white glitter as well, so I chose a baby-blue creme polish instead (Color Club – Take me to your Chateau). The application of this one is a little more tricky – the clear base is quite thin so I had to snag the bigger glitter particles and place them on my nails. Nevertheless this is a fun nail polish that makes me happy every time I look at it! I topped this one with a coat of Seche Vite Quick Dry as well. Those two polishes are all I can contribute to #wirlackierencirquecolors as they are (unfortunately) the only polishes I own from Cirque. Have you participated in the challenge? Are you going to participate next month? The brand for next month will be Anny. I don’t own any polishes from Anny 😦 But I’m looking forward to all of your swatches! Happy Sunday everyone and read you soon! I think it is always fascinating when you come across a nail polish that is so unique that there are no dupes available. I think that YSL Peach Green is a nail polish like that, at least I am not aware of any dupes to it: It has a nice green/blue pastel base with some very visible iridescent pink shimmer, and this is all in one polish! Google-ing has not brought up any useful dupes at all, but I found a few blogs that tried to combine a similar base colour with some pink shimmer. So I went through my stash and collected all the closest pastel green/blue polishes, along with all the pink shimmer toppers that I own. Maybe this comparison will help you a little, especially if you were wondering whether a certain polish/topper is close to Peace Green or not. Spoiler alert: I did not find a perfect combination in my stash, but I encourage you to try some combinations for yourself – you might end up with a great manicure that you enjoy, even though it might not be 100% the same as wearing Peace Green. P2 – 590 who cares? I think we don’t have to mention Manhattan 08M as this is much too dark and too green/grey. (See below). But look at China Glaze – Keep Calm, Paint On! The base of China Glaze appears to be a little paler with less blue undertones. But this one came really close and I love that it also has a shimmer of its own, even though it is not a pink one! Two more close candidates were Susie N.Y. 46 as well as p2 Who Cares, see below. The Susie nail polish was a gift from Tokyo and p2 is a german local cheap drugstore brand. Both shades are a little more blue than Peace Green but look pretty close. The last two nail polishes that made it on the comparison list are Glam Nails Opal and Kiko 389. Opal has a beautiful blue shimmer itself, apart from that it might be a little too pale. Kiko on the other hand is much too vibrant and blue, see below. I liked this noname Basic shimmer top coat so much that I decided to put it over P2 and Susie N.Y. as well. It makes both base polishes look a lot like YSL Peace Green. See below for an overview. You can also see here that Models Own Indian Ocean and Essence Feels so Good are stunning shimmers but their particles are much bigger than the glow-y sheen of Peace Green. So, my favourite shimmer top coat is hands down the basic no name. I applied it over my three favourite base colours on my nails below, and on my ring finger is Peace Green for comparison. 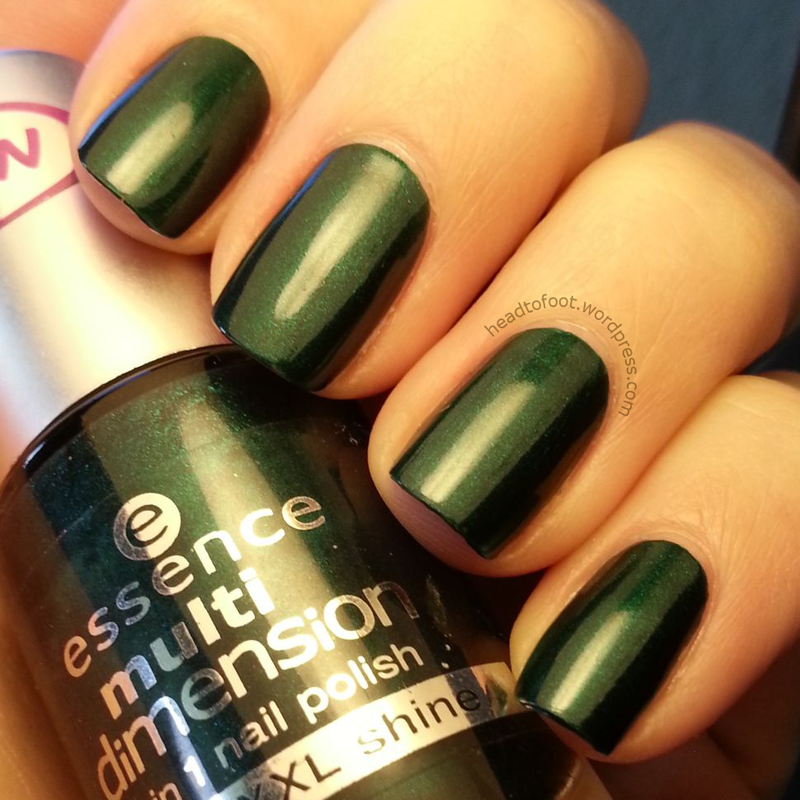 You can see that the shimmer of Peace Green is much warmer than the basic top coat. I hope this comparison was helpful for you! It certainly was a lot of fun for me – even though I couldn’t find a 100% match, I found a lot of beautiful combinations! For example, I love Models Own Indian Ocean over a pale green base, absolutely beautiful! I recommend experimenting for yourself! if you’re wondering what I have been up to lately – here are some impressions of my manicures that I only posted on Instagram lately. These were all two coats with one coat Seche Vite on top. Essence Fantasia “Take a ride on Pegasus”. A pink/red base with light blue shimmer. I love the cool toned shimmer! Manhattan Bonnie Strange no. 006. A brown base with warm-toned sparkling golden and red shimmer. This is soo pretty but impossible to capture! Catrice Sold Out For Ever. A mint green with a very subtle green shimmer which is quite camera-shy. 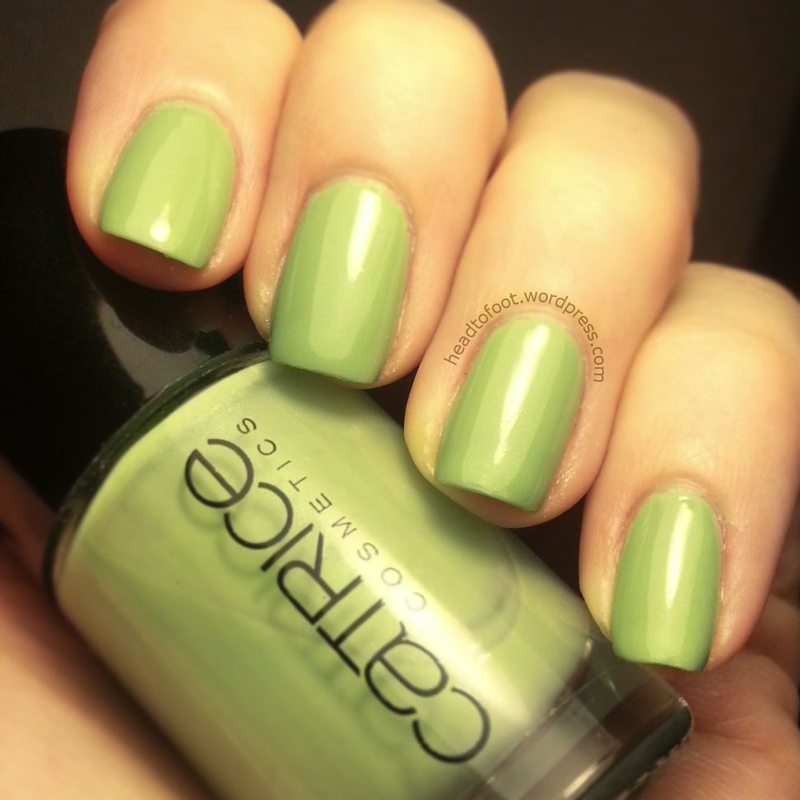 Supposed to be a dupe for Chanel “Jade”. 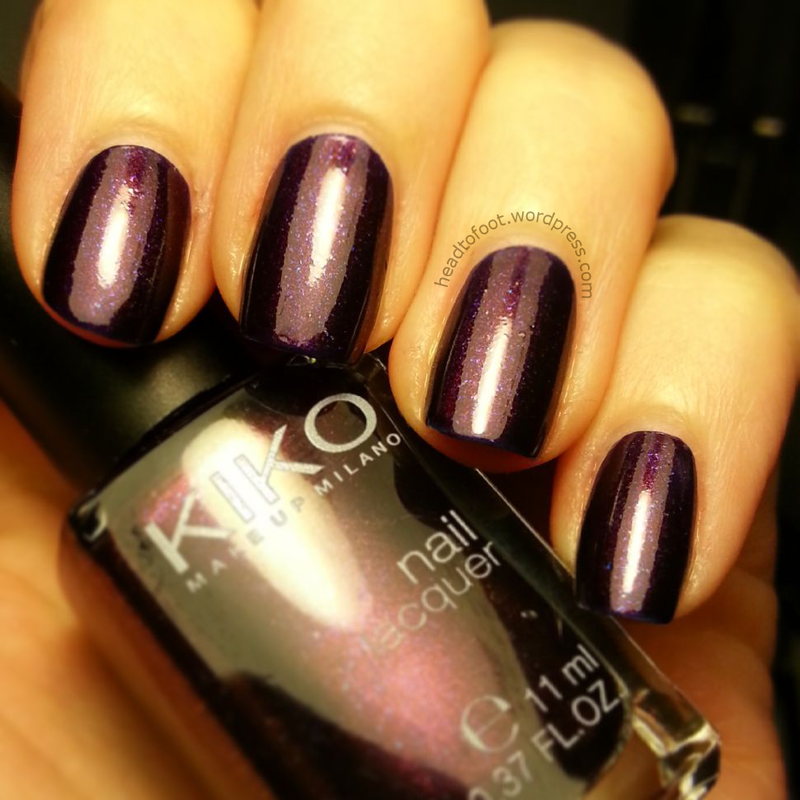 Kiko 497, Pearly Indian Violet. The base is a dark purple jelly with tiny burgundy shimmer and sprinkled with larger purple iridescent shimmer. Supposed to be a dupe for Chanel Taboo. Essence “All Access”. An oldie but goldie and technically a one-coater (even though I always do two coats as a habit). Such a vibrant deep green, beautiful! P2 “before sunrise”. What a beautiful color for the upcoming fall! A burgundy/dark pink/purple shimmery polish. Well, I hope it will take some time before we have to start thinking about what to wear on our nails in autumn. I’m not done with summer yet!! I really hope we will get a few more sunny and warm days. Are you looking forward to the autumn season or could you do with a few more hot days of summer?